My East Coast and Mid-West readers can feel free to roll their eyes with this…but SNOW!!!!!!!!!!! Boys. 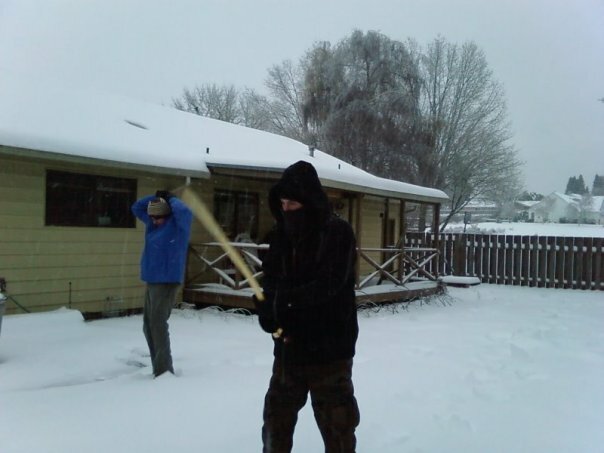 Yeah, so being snowed in for 5 days with two guys who decided to sword fight with sticks in the snow was interesting but nothing like that has happened in here in years. Well the snow finally came! On Thursday I was working at my desk and saw that some little flurries were coming down outside. I checked periodically but downtown seemed fine. Yet half the office was leaving. Portland Public Schools shut down at noon (when there wasn’t any snow yet) and I decided to stick it out at work for awhile in hopes that they’d shut the office down officially (which means we get paid for the whole day). Didn’t happen. By 2:30 the snow was coming down even more and so I decided to leave. Glad I did! The 10 mile drive home that usually takes 20 minutes after work took Michael and 1.5 hours. Traffic was ridiculously slow. It was like people completely forgot what the rules of the road were. 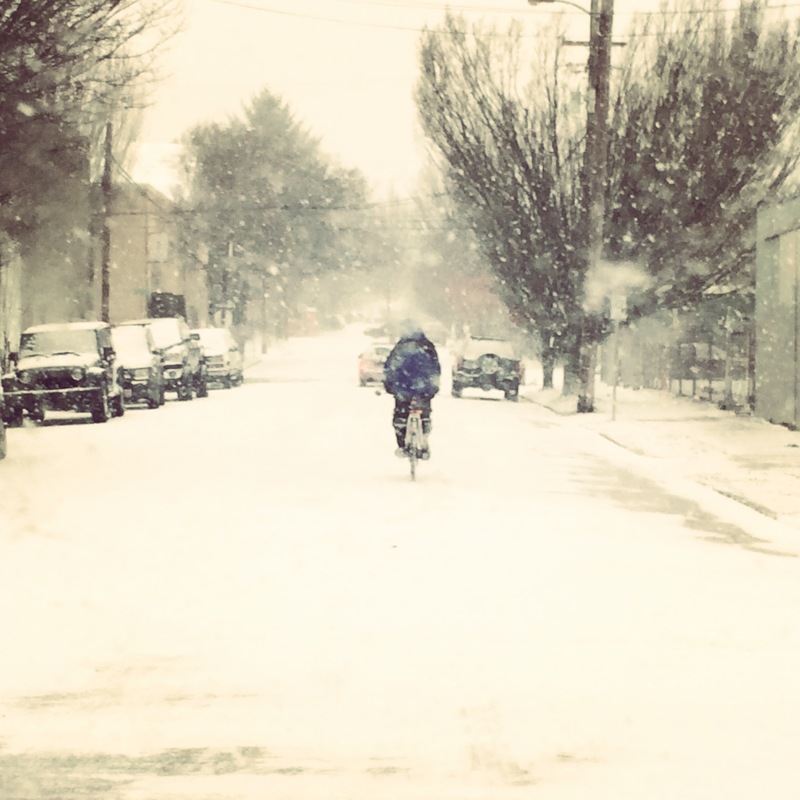 That is a cyclist in front of us. They were out in droves. I guess I should be surprised, but I’m not. 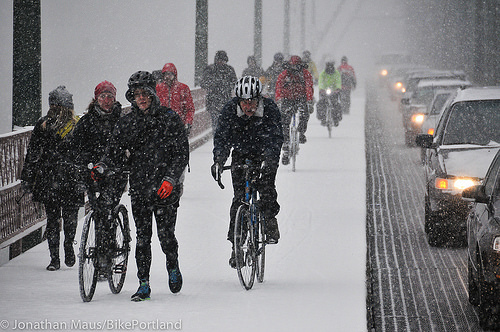 This photo is from BikePortland.org. It’s a great picture of the city! 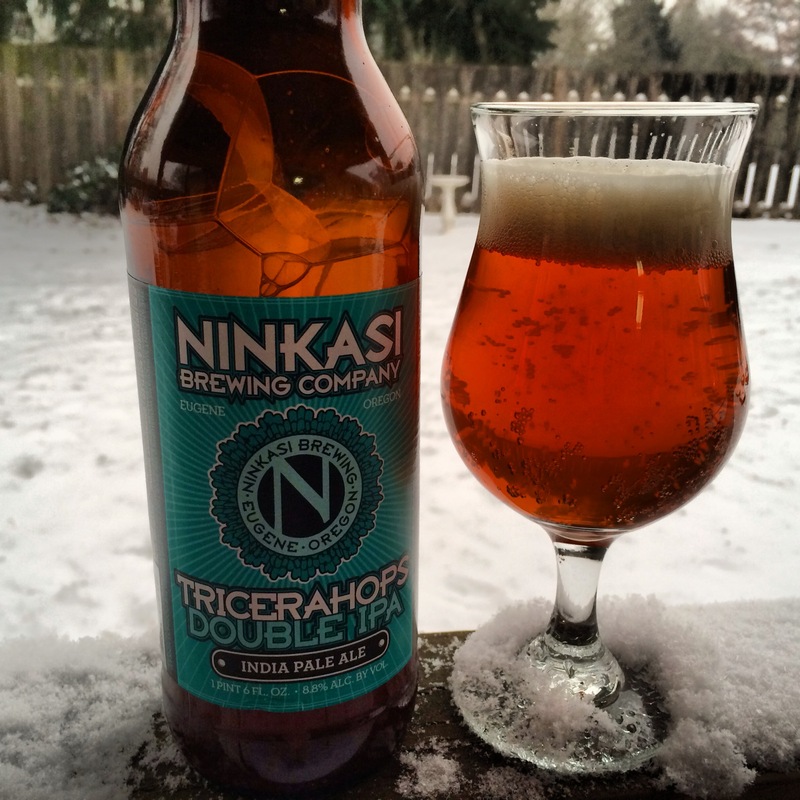 Reading through the comments on the post apparently people think we’re ridiculous for being excited about snow (one commenter said “in Minnesota this is just called Thurday”)–right right right. But it never snows here! We settled in for the very long and slow drive home and made one stop to pick up a Papa Murphy’s pizza. 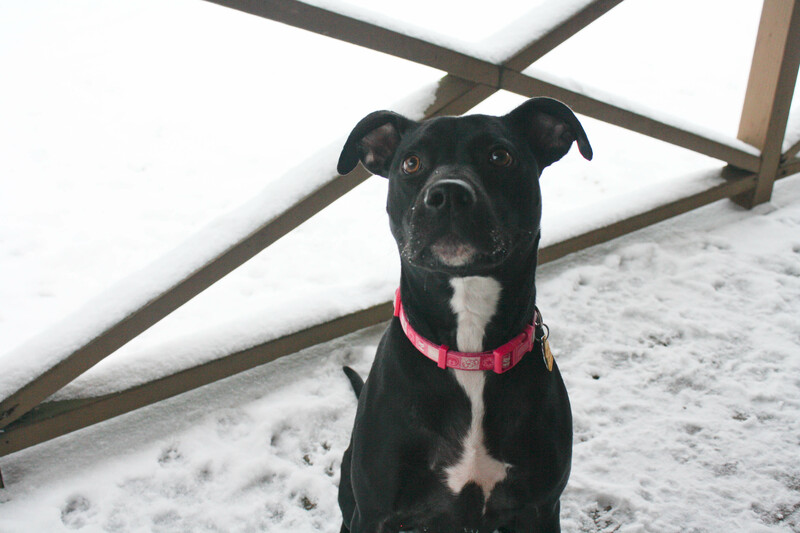 When we got home I took Bella outside for her FIRST SNOW! OH MY GOD SUPER SPAZ!! She loved the snow. 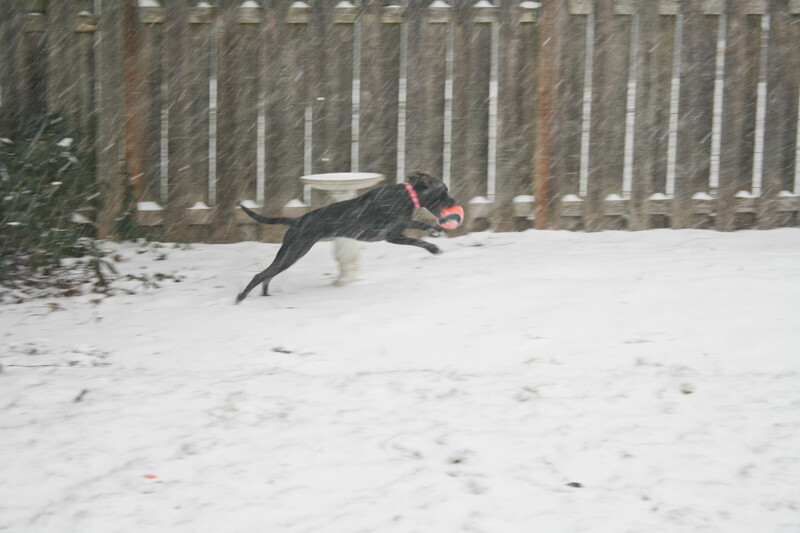 She ran around the yard at full speed, turning in circles, jumping and rubbing her face in the snowy earth. 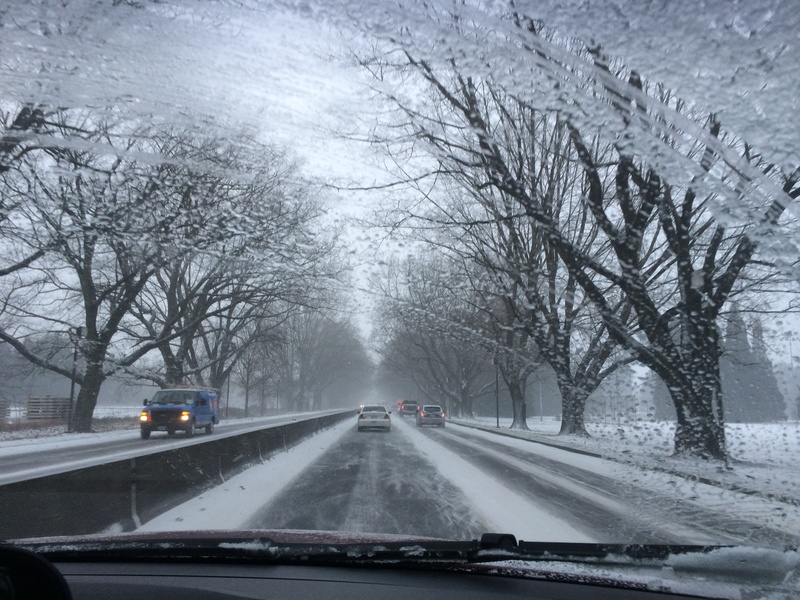 It was so much fun to watch–it was like experiencing the very first snow experience of a child. I had 2 slices of the Papa Murphy’s deLite pizza (around 400 calories total) and then later we had some popcorn as a snack. For a rest day, I definitely indulged and went over my calories for the day. I think I got overly excited about 4 days off in a row in the snow! Friday morning I woke up to discover the office was closed! Yay!!! The possibilities for the weekend were endless. 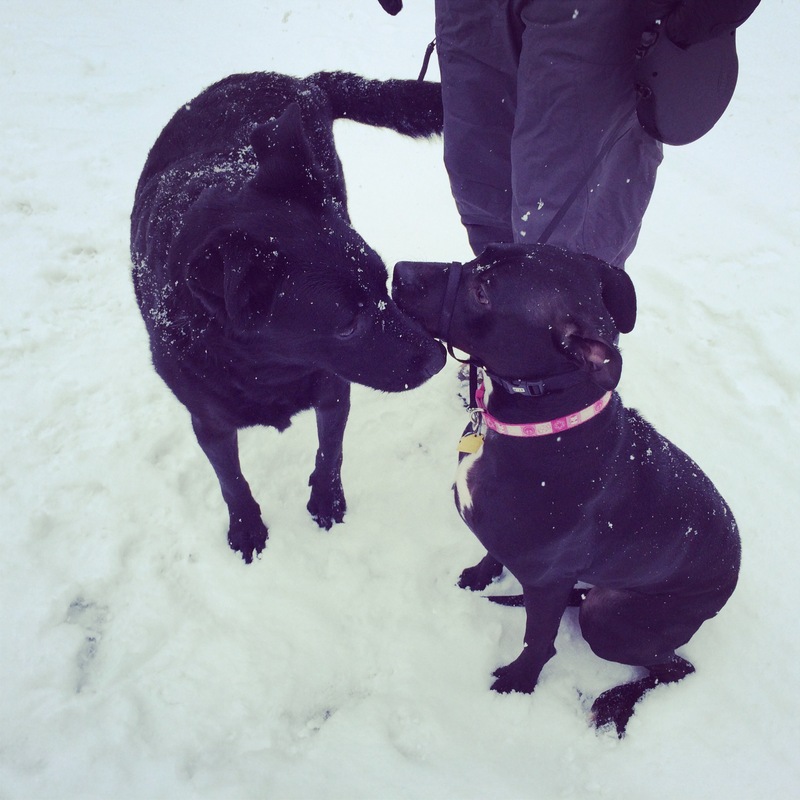 There were so many things I wanted to do–catch up on my Netflix DVD I’ve had for three weeks, finish a few books I’ve been reading, do my taxes, play in the snow with Bella….. I was so happy and so excited to see how much she LOVED THE SNOW. Totally obsessed with it. She loves the snow more than food, that’s huge. 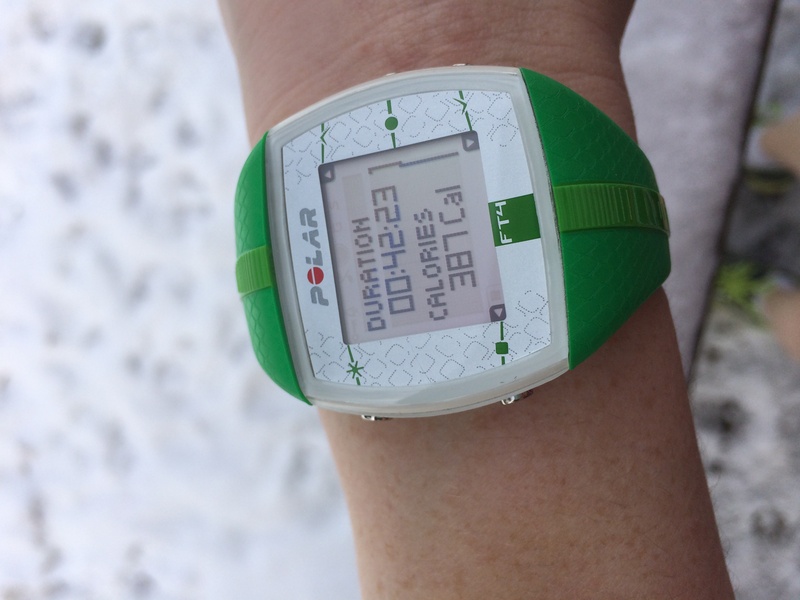 So I started my Friday off with an at-home workout. 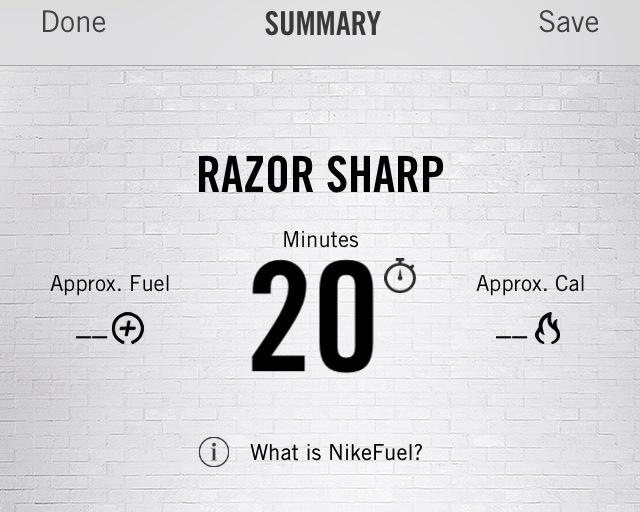 I used the Nike Training Club App that I’ve used many times in the past. The app has changed formats since I’ve used it–now you have to download the workout to use it. But it was super simple and took two seconds to download on my phone from the app. After my workout I cleaned the house, did laundry and finished my taxes. After lunch Michael and I took Bella for a walk in the neighborhood. 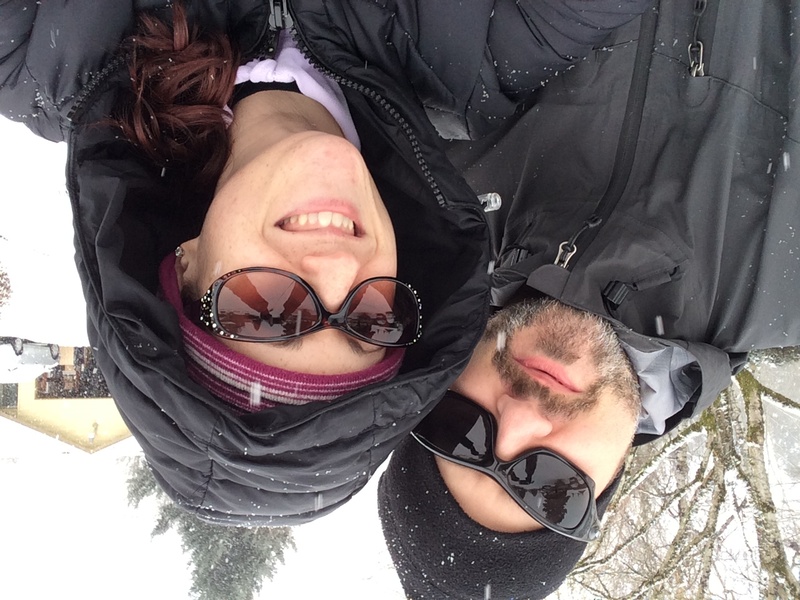 We got bundled up in our snow gear like we were going snowshoeing. The street was pretty quiet, just a few people were out and mostly it was kids pulling sleds heading over to the school in the neighborhood to go sledding. It seemed like ALL the neighborhood kids were out, young and teenagers, sledding down the hill on the school field. It was so fun to watch. Bella made some friends on the street, too. Several neighbors were out with their dogs. 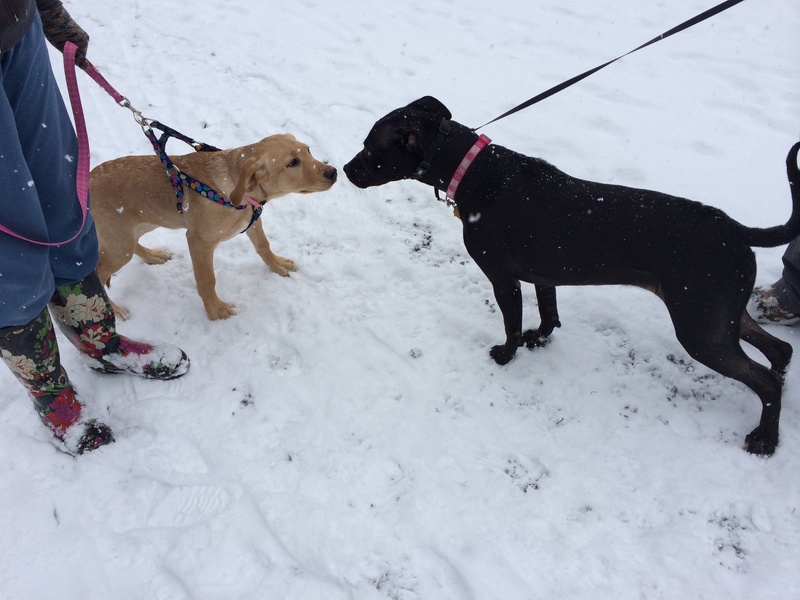 Bella met a few dogs and made some friends–she especially loved the little 4 month old puppy also named Bella! What a cutie! Puppies!!! Even after playing in the snow for two days, Bella still loved it. 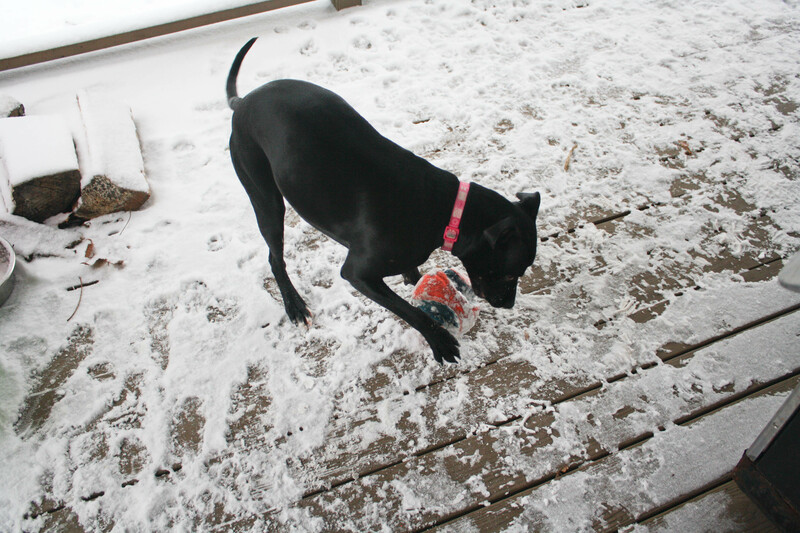 She was not getting tired of it all and she’d race to the sliding door whenever I said the word “snow.” It was such a nice break from the normal routine!